Google is known for throwing Easter Eggs—hidden games, tricks, and other fun things—into its products. At one point or another, I’m sure you’ve seen some of these little things, whether it’s the Android version icons or one of the many hidden games in Chrome. 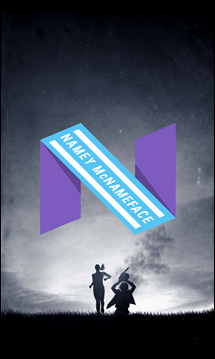 Today, we’re going to talk about some of our favorites from Chrome, Android, and Google Search on the web. 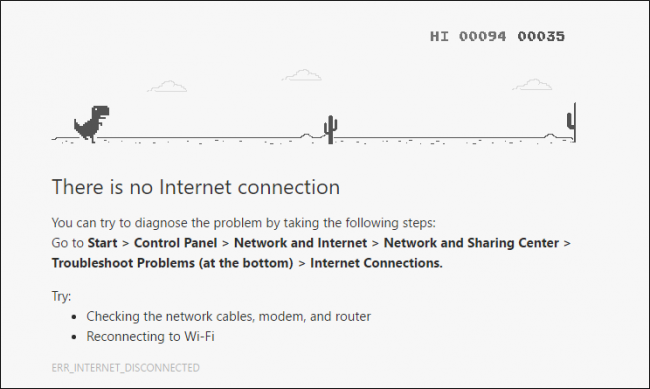 We’ve all seen the dreaded “no network connectivity” T-Rex show up when the internet isn’t working, but what you may not realize is that this is also a game. It’s an endless runner where you, the dashing T-Rex, have to run as far as you can, jumping over cacti and pterodactyls as they come your way. So, how do you play this game? Simple: the next time you see the “no network connectivity” screen, just tap the space bar to start the game. The T-Rex will start running, and you can press spacebar to make him jump over obstacles. Just keep him safe, okay? Remember the old school Atari game Breakout? It’s basically a Pong-esque game, but you use the ball and platform to break a bunch of boxes (it’s more fun than it sounds). If you want to relive the golden days of gaming, head over to Google.com and type “Atari breakout” in image search. It will instantly transform into a game of Breakout, and you’re on your way to wasting the next three hours. What’s a good retro gaming session without some Pac-Man? Most would attest that it’s not a very good one at all. If you’re in the mood to watch a little yellow circle guy get chased by ghosts and eat…whatever those little dots are, then Google has your answer. 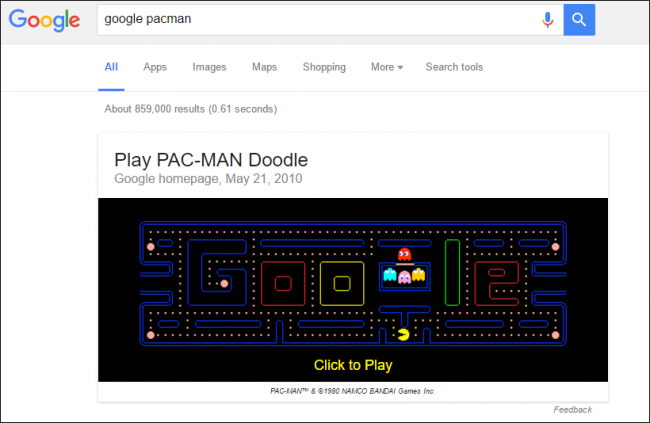 Head over to Google Search, and just type “google pacman”—this Easter Egg was originally a Google Doodle from 2010, but a playable version will still launch with that search command. 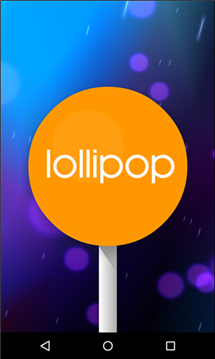 Each version of Android over the last five years or so has a hidden icon representing its version. 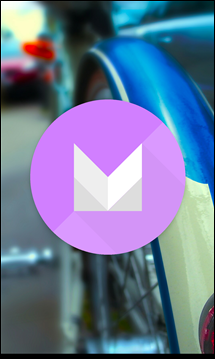 You can’t really do much with this icon, but it’s still neat to know it’s there, and it’s always fun to see what the icon is when a new version of Android comes out. To get to the icon, first head into the Settings menu and scroll down to “About phone.” From there, find the Android Version and tap it several times—the appropriate icon will show up according to the version of Android. Neat. When Flappy Bird first came out, it took over the casual smartphone gaming scene. As a casual time-waster, it filled the void many people were looking for pretty easily: it’s easy to play, hard to master, and incredibly challenging. In fact, it may have been a little too challenging—people were getting so frustrated with it, some were throwing (and breaking!) their phones. Thus, the developer decided to pull the game at the pinnacle of its popularity. 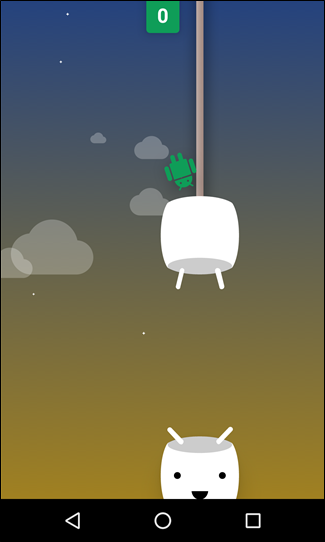 While that was a bummer at the time, the Android team decided to resurrect the game with a little twist of its own, and use it as one of Android’s Easter Eggs. 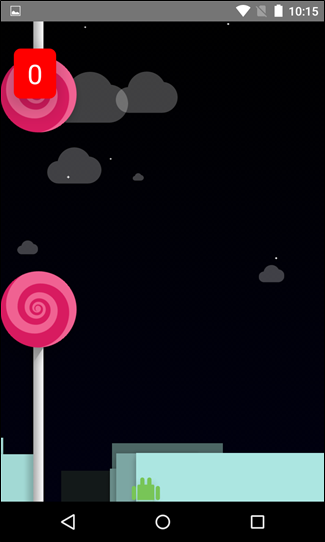 To play “Flappy Droid,” you’ll first need a Lollipop or Marshmallow phone, then find the hidden version icon using the instructions above. Tap that icon a few times, then long-press is a handful of times. The game should launch. Enjoy your frustration. Do a barrel roll: Watch Google spin! Zerg Rush: Destroy all search results. 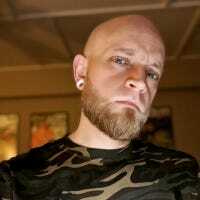 Askew: Give Google a little tilt. Flip a coin: Don’t have a coin? Let Google handle the heavy lifting for you. Roll a die: Six sides. One result. Google Gravity: Everything is falling. Everything. Note: you have to click the first results in the search results for this one to work. Google in 1998: Ah, baby Google. So cute. Anagram: Did you mean “nag a ram”? Bacon Number [actor name]: Ever played Six Degrees of Kevin Bacon? Well, now you can do that with Google. Seriously, give it a shot. Google makes many super useful products, but it’s also cool to see the “fun” side of the company. And this is by no means a definitive list, either—there are quite a few more Easter Eggs out there. So keep an eye out, you never know what you’ll stumble across.